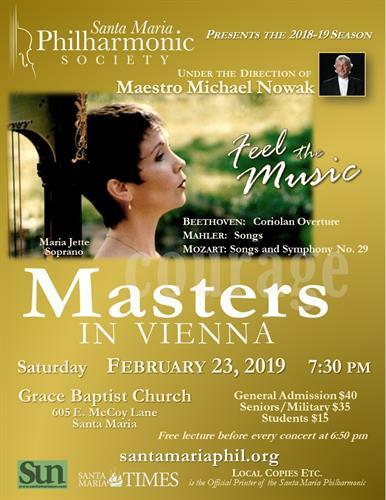 Feel the Music as the Santa Maria Philharmonic presents Masters in Vienna. You will hear the brilliant sounds of some of the master composers who gathered in Vienna in the 17th and 18th centuries, and the spectacular voice of soprano Maria Jette. Vienna has been the center of culture and music for centuries, and was the home to some of the greatest composers of all time. Maestro Nowak opens the program with Beethoven’s dramatic and poignant Coriolan Overture, and continues with the brilliant Symphony No. 29 in A Major, by Mozart. 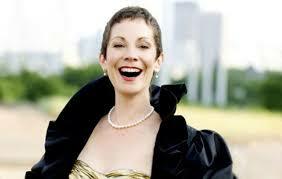 The featured soloist Maria Jette will sing two delightful Mozart Songs for soprano and orchestra, as well as a collection of extraordinary songs from ‘Des Knaben Wunderhorn’, based on German folk songs and folk poetry.